Francis (or Frank as he was wont to be known) was born circa 1843 in the Durham area of Yorkshire – North Riding, England. His father, Thomas William Galloway had married Sarah Anne Crowne Pattison on 5 May 1841 at Newcastle. Imbued with an adventurous spirit, Thomas Galloway had been induced to come to the little known Colony of Natal by his brother John. He and his family emigrated on the King William in 1850 landing at what was then a very primitive Durban. Along with his wife and children Galloway brought along four servants and his sister – in – law. Having paid for their passage Galloway was entitled to their land allotment. Having arrived in Natal the family set about their business and were soon immersed in farming north of the Umgeni River. Young Frank was a pupil at Reverend Alfred William Lovely Rivett’s school at Umhlanga where he was to be found in a reference dated June 1858. Captain Charles Saner was in command during the period which concerns us i.e. when the Zulu War broke out at the end of 1878 and the Corps was called out for active service. After seventeen years of training and preparation the Victorians were being given the chance to prove their mettle. Mustering 4 Officers, and 33 Other ranks they left Verulam on 2 December 1878 for the frontier. Galloway’s name is amongst those who responded to the mobilisation call being assigned the rank of Trooper and no. 25. He was, by the end of 1878, a Trader by occupation necessitating many journeys in to the interior where he had dealings with the Zulu tribe he would soon be at war with. His residence was at “The Hope” - his father’s property. On 3 January 1879 the Corps reached its objective, Thring’s Post, moving, on 10 January to the Lower Drift linking up with other Units to be known as the Natal Volunteer Force. Having crossed the flooded and turbulent Tugela River the column reached the Inyezane River on 22 January 1879 and stopped for breakfast there. The spot was covered with tall grass and studded thickly with bushes; deep wooded gullies flanked it on either side. After about half an hour shots were heard fired at or by the outposts giving a clear indication that the enemy were on hand. Horses were immediately caught and saddled; all stood to arms in skirmishing order. The Zulu warriors, numbering, it was officially estimated, three to five thousand, were now seen advancing in dense masses within 100 yards. A heavy fire was opened on them, stopping their advance and thinning their ranks. After the first flush of excitement, each man poured in eighteen shots to the minute with deadly effect. It was reported of them that, while kneeling in the long grass, they conversed unconcernedly as if in a sham fight. This was their baptism of fire; their years of training had not been in vain. The Victorians, who formed part of the advanced guard were the first troops engaged in that battle suffering no casualties that day. After the battle they continued as part of the advance guard of the column heading for Eshowe, which was reached that day. They remained there a few days, performing various duties as videttes. Thereafter, when the mounted troops were ordered to return to the Tugela, they crossed to the Natal side of the river and proceeded to Thring’s Post to repel a reported raid. 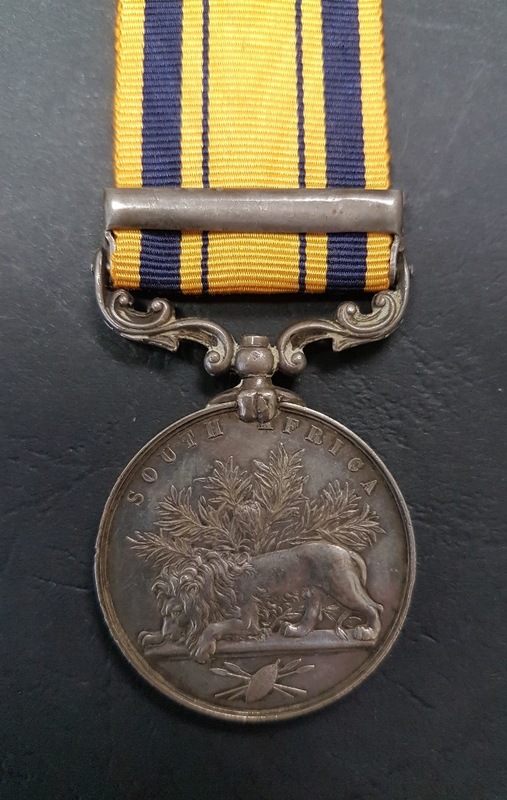 Galloway was also one of only 56 men who comprised the Natal Volunteer Guides, a composite Regiment made up of Colonial Volunteers who were prepared to see further action in Zululand and who were part and parcel of the battles of Gingindhlovu and Ulundi. 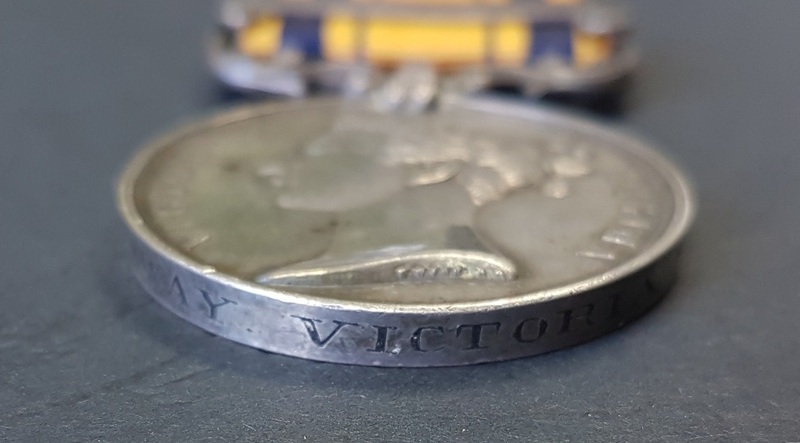 Of this number 20 came from the Victoria Mounted Rifles. The campaign honour “South Africa 1879” was conferred on the V.M.R. They were disbanded, on amalgamation with the Natal Mounted Rifles, in 1888. For his efforts, Frank Galloway was awarded the S.A.G.S. 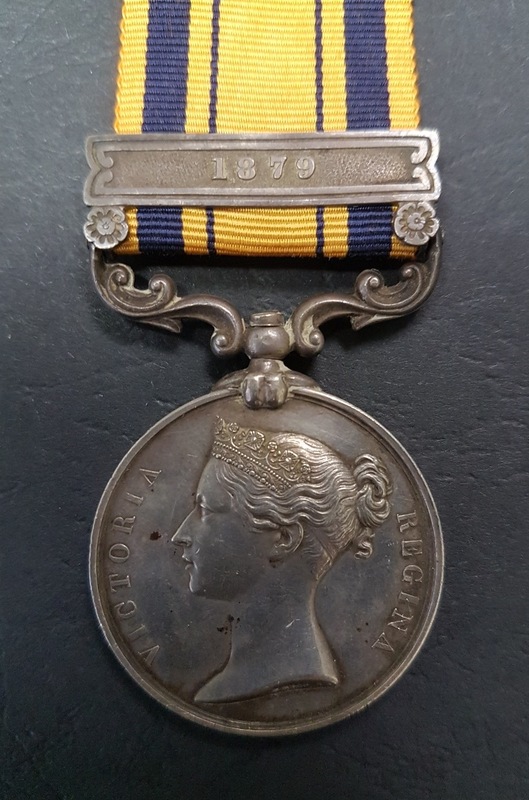 medal with 1879 clasp. Sir, I beg to apply for a government appointment as Border Agent or in any other suitable capacity you may have at your disposal, some time since I had the honour to make application for a Sub Commissionership in the Zulu Nation Reserve where I had held the position of Administrator under Chief Dunn which position I lost in consequence of the resettlement of Zulu land. Being desirous to obtain a similar appointment I take the liberty of making this application, trusting that it will meet with your favourable consideration. Your obedient servant etc. F. Galloway. Shepstone referred this to the Governor, Bulwer, who asked that “Mr. Galloway’s letter be acknowledged.” This was duly done on 3 July 1883. Sir, I have the honour to apply for a licence to introduce labourers to the number of one hundred into the Colony overland, under Section 15 Law 15 – 1871, the wages I propose to pay are 25/- per month to men and from 10/- to 15/- to ladies. Presumably he was also the Galloway who was Superintendent of Roads in Zululand and who, in November and December 1887, with four police messengers, escorted Chief Zibhebhu and his followers from Bond’s Drift on the Tugela, back to their territory in the Ndwandwe district. Sir, In accordance with Govt. Notice No. 255 – 1888 I have the honour to apply for His Excellency the Governor’s licence to introduce into Natal on their way to the Gold Fields from Zululand 100 Zulu labourers at 30/- per month. I have applied to the Resident Commissioner Zululand for permission to engage the men. When exactly Frank Galloway passed away is uncertain but it would appear that he never married and had no issue with which to continue his line. His father Thomas, who had lost a foot in 1865 and suffered much thereafter from the wound, had passed away in 1881. -	Page 11, 14 of Shelagh O’Byrne Spencer’s British Settlers – A Biographical Register in Natal Volume 7. -	CSO (Colonial Secretary’s Office) papers in the Natal Archives Pietermaritzburg. -	Pages 13 – 26, Natal Mounted Rifles 1854 – 1969 by Eric Goetzsche. -	Medal Roll to the Victoria Mounted Rifles WO 100/49 Page 283. 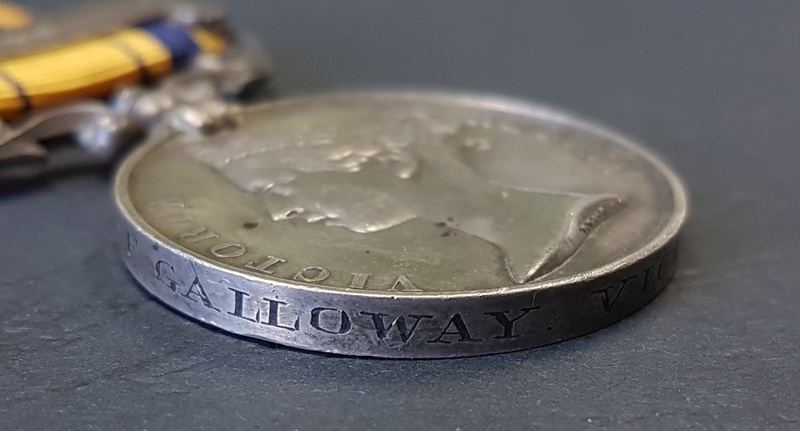 What a lovely medal and I think these days, generally speaking, the medal with the 1879 clasp is becoming ever harder to actually find.